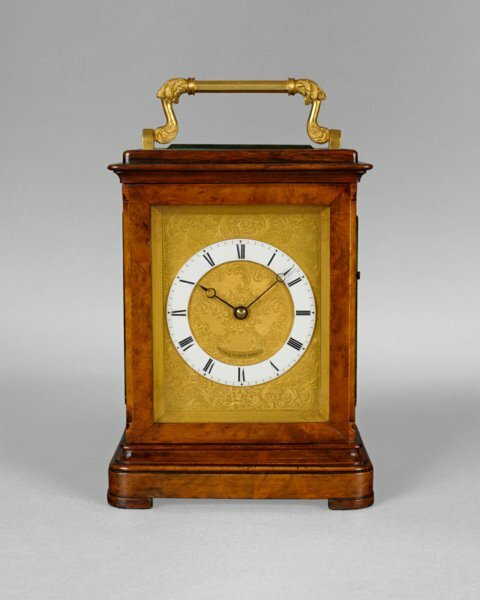 Anthony Woodburn deals in fine antique clocks - 17th & 18th century English antique bracket clocks, longcase clocks and antique barometers, including pieces by PAYNE & CO, New Bond Street, London . A nineteenth century English carriage clock in a walnut five glass case. Standing on block feet, the moulded case with rounded corners rises to a gilt brass carrying handle. The four sides and top are glazed with chamfered glasses to the sides and top. The elongated 4 by 5 inch dial. The dial, with a gilt finish is profusely and delicately engraved in a floral and foliage design around and within a narrow enamelled chapter ring. The twin fusée eight-day duration movement includes maintaining power and hour strike on a gong with repeat operated from a plunger on the side of the case. The high quality platform lever escapement with gilt finish has a compensated bi-metallic balance wheel with compensating screws around. Payne and Co. were fine makers working in New Bond Street, London in the 19th and 20th century.